Mother Nature sure seems to have a huge sense of humor . . . just when we felt Spring had sprung with beautiful sunny days almost to 80, she plunges us in another cold blanket of ice! It’s another snow day in Texas- turn on the fireplace and pop in a movie! It’s always good to have a few really good meals that take less than 30 minutes to fix in your recipe box. 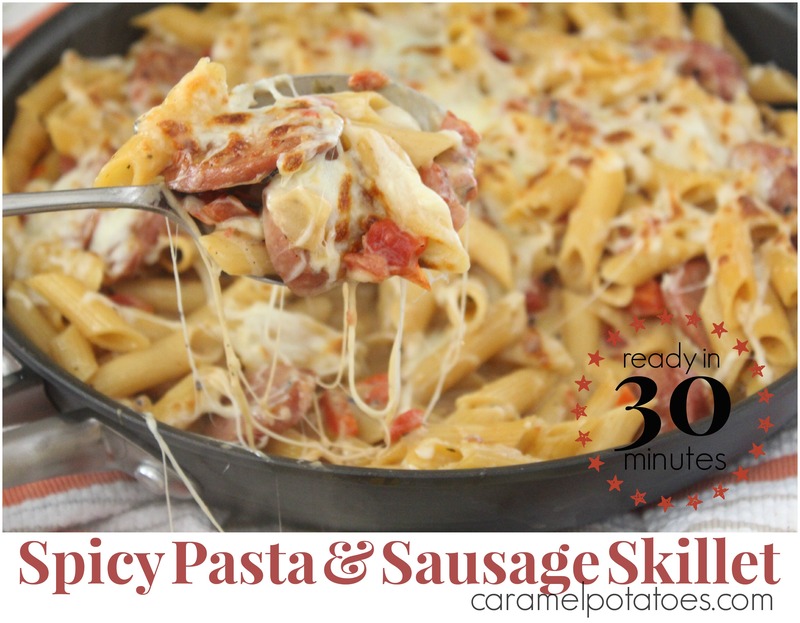 A good friend shared this Spicy Pasta and Sausage Skillet with me a few weeks ago- it is one you definitely want to add to your collection for a fast and yummy dinner in no time. Just start with sauteed sausage, peppers, and onions. I used turkey sausage which we love at our house- but chorizo sausage will turn up the heat if you like. Now just add chicken broth and garlic for lots of flavor, Ro-Tel tomatoes for a little kick, and just a 1/2 cup of cream for richness. You’re going to cook the pasta right in the same pan. 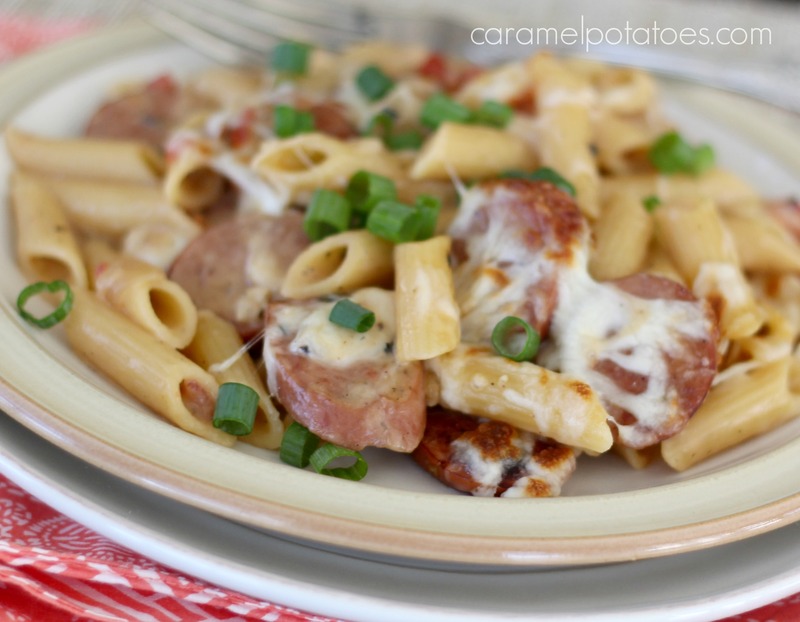 Once the pasta is cooked your going to add cheese for ooey-gooey, creamy goodness the whole family will love. 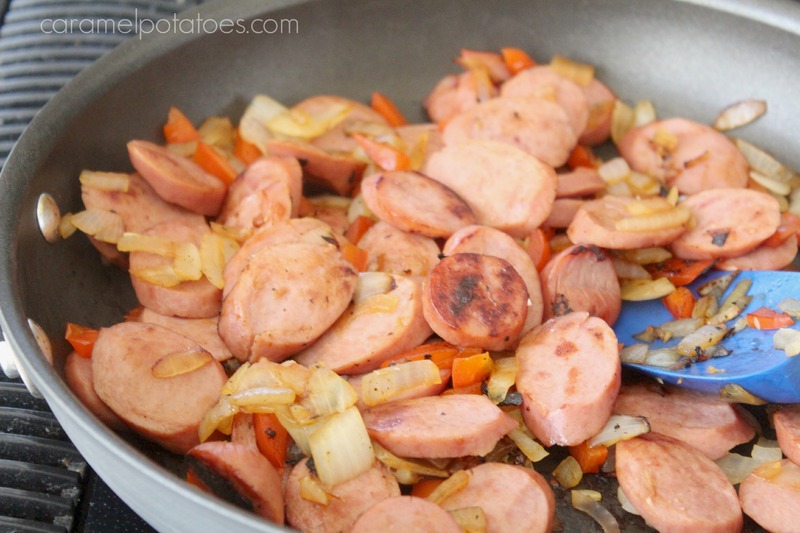 Cook sausage, onion, and peppers in large oven-safe skillet over medium-high heat until lightly browned, about 8 minutes. Add garlic and cook until fragrant, about 30 seconds. 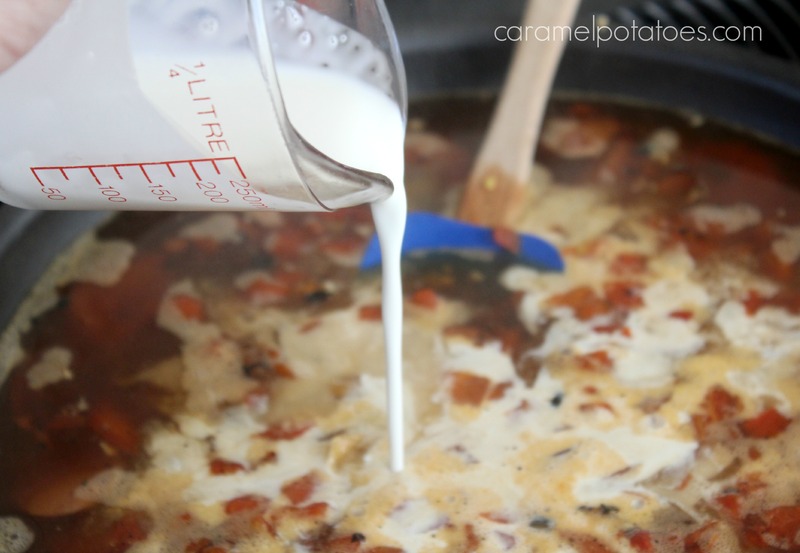 Stir in broth, tomatoes, cream, pasta, salt, and pepper and bring to boil. Cover pan and reduce heat to medium-low. Simmer, stirring frequently, until pasta is tender, about 15 minutes. Heat oven broiler. 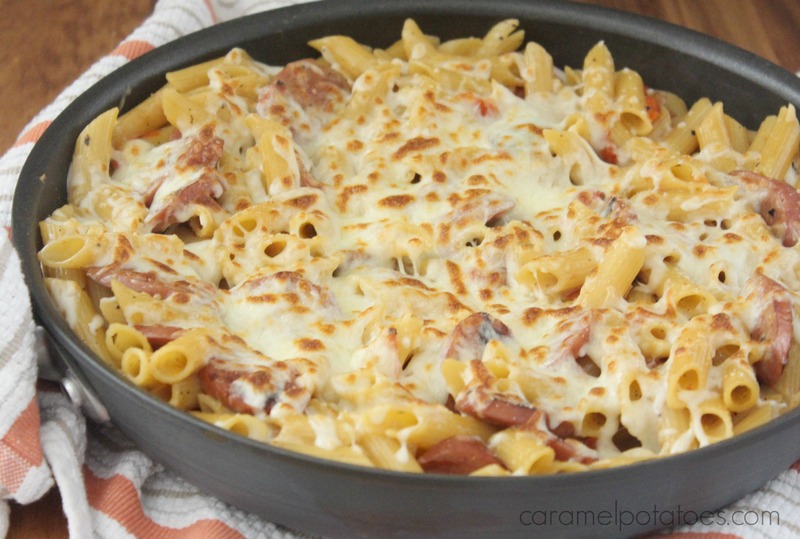 Remove the pasta and sausage from heat and stir in 1/2 cup cheese. Top with remaining cheese and broil until cheese is melted and spotty brown, about 3 minutes. Sprinkle with scallions if desired. Serve hot. Note: For a lot of heat use chorizo sausage and the spicy Ro-Tel along with pepper Jack cheese and a little hot sauce. if you kids don’t like things spicy, use the turkey sausage, replace the Ro-Tel tomatoes with regular diced tomatoes and add mozzarella for the pepper Jack Cheese. 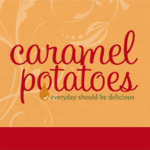 Find the blend of flavors and fits your family best. I am so hungry and this looks sooo good! Going to the store now. Wow, this looks great! And sounds so easy! SassyKay – It is easy and one of my hubby’s favorite! Let us know how you like it.